Paper flowers are an all-time favorite paper craft project for most craft enthusiasts. They are relatively quick, easy and fun to make. Some paper flowers look like their live counterparts, and some are conceptual. The paper flower you choose to make depends on what style you prefer, but both types of paper flowers are lovely. Some paper flowers are so beautiful that people use them in wedding bouquets, as boutonnieres and table decorations. Today’s paper flower project is a beautiful dahlia. The dahlia is a symbol of elegance, inner strength, and creativity. This dahlia flower tutorial is more complicated than most paper flowers, but the results are worth the extra effort. The paper flowers are as elegant and beautiful, as the symbols they represent. 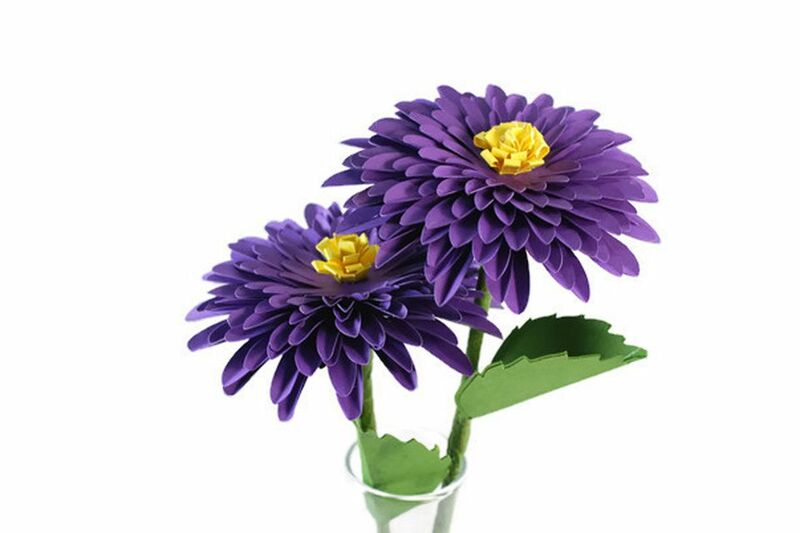 This flower craft is made out of cardstock and can be created in less than 15 minutes if you use an electronic die cut machine. It will take a little longer if you are cutting everything by hand, but the final floral product will be beautiful either way. You could also make the flowers from Italian crepe papers, but they will take more time. Everything will have to be cut by hand, as you cannot cut delicate crepe paper on an electronic die cut machine. Download the zip file and extract to your folder of choice. Print the flower parts onto the card stock and cut by hand, or cut the flower parts with an electronic die cut machine. Fold each petal in half at the fold line giving the flower petals realism. Stack the purple flower petal parts on top of one another with the largest piece on the bottom graduating to the smallest flower petal round on the top. Line up the center holes on each layer. Secure the pieces together with hot glue in between each layer. Make sure that no glue covers the center hole. Cut the disc florets (flower head center) template from yellow cardstock. Fold the yellow disc floret cut-out in half lengthwise. Place a bit of hot glue on the end of the yellow cardstock cut-out and place the edge of the wooden dowel onto the adhesive on the cardstock. Roll the yellow cardstock around the wooden dowel to form the flower head. Attach the end of the yellow cardstock strip with a bit of hot glue. Wrap the wooden dowel with floral tape. Place the dowel through the hole in the center of the top of the paper dahlia flower head. Put a bit of hot glue under the yellow flower center (disc floret) to attach it securely to the top of the purple dahlia. Cut the sepals from green cardstock. Curl the edges downward using a pen or pencil to give them a realistic look. Slide the sepals over the bottom of the dowel until they reach the bottom of the flower head. Secure the sepal to the flower head with a bit of hot glue. Cut a piece of green cardstock to the size of 0.5-inch by 8 inches. Roll the cut cardstock around the dowel under the sepals as in the photo above and secure with hot glue. Cut another piece of green cardstock to the size of 0.25 inch by 8 inches. Attach one end of the green strip to the rolled green strip on the dowel. Roll it around the dowel on top of the other piece of cardstock. Wrap green floral tape tightly around the top of the dowel over the covered card stock up to the end of the dowel. Make sure to twist the paper tape firmly so that the tape sticks to the dowel and does not become undone. Cut out two leaves out of dark green cardstock. Cut a 5-inch piece of medium strength floral wire. Glue the leaves together, with the floral wire centered inside using adhesive spray. Cover the floral wire with tightly twisted floral tape. Place the leaf onto the dowel. Start at the bottom of the leaf and twist floral tape tightly around the dowel and leaf stems. Attach another leaf to the other side of the dowel stem. Your beautiful paper dahlia is now ready for display. Put it in a vase with one or more paper flowers, and enjoy. Add some seeded eucalyptus or baby's breath as a floral filler to add a touch of realism if desired. Celebrate the Fall Season with Some Pretty Paper Spider Mums! Make a Paper Mache Doodle Heart for your Sweetie!